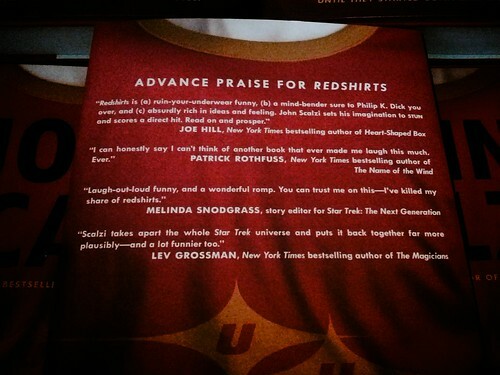 We’re three weeks out from the release of Redshirts, and I just got my boxes o’ author copies, so now is a fine time, I think, to show you the back cover, which has lovely blurbs for the book from Joe Hill, Pat Rothfuss, Melinda Snodgrass and Lev Grossman. They are all very kind, and also what I love about each of these is that they bring home the point that, hey! 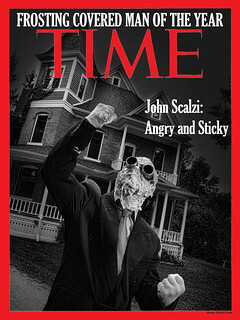 This book is funny! This is actually important to me, for reasons I plan to go on about at length in a future entry. But in the meantime, thanks Joe and Pat and Melinda and Lev. Glad you liked it. 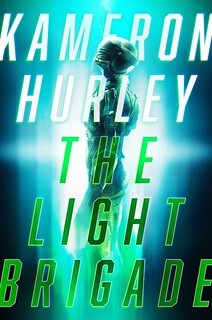 [T]his humorous and thought-provoking novel should appeal to fans of sf (especially Star Trek devotees) who like a good laugh along with their big ideas and space action. One note: The Library Journal review also has a honking big spoiler for the book, so I’d avoid the full review if you don’t want a major plot element revealed to you. Which reminds me to note to other potential reviewers of the book: Hey, this is a book that can be spoiled. I’m certainly not going to tell you how to write your reviews — I’ve been a pro critic for two decades, and I know I don’t work for the people whose work I review, so why should you — but I will make the following plea: if you decide you need to make a spoiler, please please please mark it so readers don’t come to it unaware. I think it’s the correct balance between saying what you want to say and letting the reader come to the book with all its potential entertainment value intact. Thanks. So, the challenge: how to get across the ideas bound up in the word “privilege,” in a way that your average straight white man will get, without freaking out about it? As the game progresses, your goal is to gain points, apportion them wisely, and level up. If you start with fewer points and fewer of them in critical stat categories, or choose poorly regarding the skills you decide to level up on, then the game will still be difficult for you. But because you’re playing on the “Straight White Male” setting, gaining points and leveling up will still by default be easier, all other things being equal, than for another player using a higher difficulty setting. Likewise, it’s certainly possible someone playing at a higher difficulty setting is progressing more quickly than you are, because they had more points initially given to them by the computer and/or their highest stats are wealth, intelligence and constitution and/or simply because they play the game better than you do. It doesn’t change the fact you are still playing on the lowest difficulty setting. 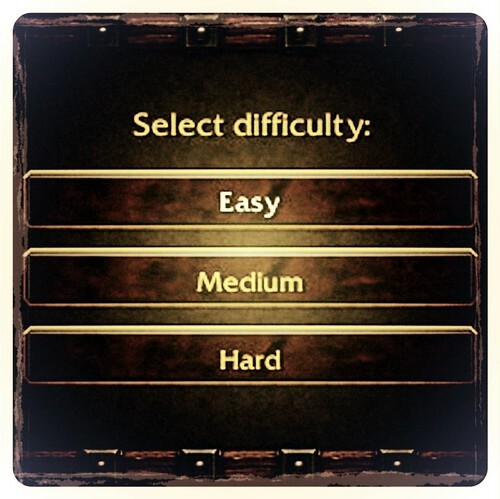 And maybe at this point you say, hey, I like a challenge, I want to change my difficulty setting! Well, here’s the thing: In The Real World, you don’t unlock any rewards or receive any benefit for playing on higher difficulty settings. The game is just harder, and potentially a lot less fun. And you say, okay, but what if I want to replay the game later on a higher difficulty setting, just to see what it’s like? Well, here’s the other thing about The Real World: You only get to play it once. So why make it more difficult than it has to be? Your goal is to win the game, not make it difficult. Oh, and one other thing. Remember when I said that you could choose your difficulty setting in The Real World? Well, I lied. In fact, the computer chooses the difficulty setting for you. You don’t get a choice; you just get what gets given to you at the start of the game, and then you have to deal with it. Not every book has a predictable genesis. Indeed, A Confusion of Princes, the latest novel by Garth Nix, is one of those whose beginning is best described as a series of detours, resulting in a book. Come, walk with Nix as he retraces his steps to get to the published work. I’m not sure any of my novels have any one big idea. I like the concept of a humongous idea striking suddenly, after months or possibly years of lying around doing not much at all, allied with the popular belief that post-lightning all you have to do is retreat to a darkened room and bash out the words, a kind of a minor bureaucratic tidy-up after the brilliance of the lightning bolt. Maybe it does work like that for some writers. But for me the ideas are more like sparks of static electricity. Mostly small, and myriad, and occasionally annoying. They are also not random, but generated by the act of writing (in which I would include daydreaming, note-jotting and open-mouthed musing to say, the neighbourhood cat). The writing generates more ideas, in turn inspiring more writing, which generate more ideas and so on. It also got complicated because something unusual happened with A Confusion of Princes. Typically when writing a novel I start very thinly with a half-seen character and a clouded situation, and some ideas about the setting. I will then write a bit of prose that makes my initial thoughts more concrete, and leave it for a few months, sometimes longer. Occasionally, like a chef returning to a dish, I will drop back and stir things around, make some notes, maybe write a bit more. Six months or a year down the track I will write an outline for the rest of the book, an outline that I will not actually follow, but that I need to write in order to be able to depart from it later on. It is a zen outline, the act of writing it being of significance, rather than its content. When all that is done, I will write the book, a chapter at a time, revising backwards as I go along, until it is done. With A Confusion of Princes I got sidetracked after the initial phase, in which I had written a prologue (which never made it into the book) and nothing else. It seemed an excellent idea back in 2007 that I should take that bit of prose, and the few notes of setting I had already worked out, and expand upon them to create the background for a massively-multiplayer online game that I was developing with my old friend and fellow game design lunatic, Phil Wallach, with whom I have worked on a number of overly-ambitious games. After all, I thought, the game would in due course help promote the book. But what of the ideas? This is after all, not a “Dumb Idea” piece, though some (i.e. my accountant) might think being diverted into the game was exactly that. What I set out to write was a book about power, and the corruption of power; the nature of Empires and rulers and the ruled; of growing up in a Galactic Empire; falling in love and the redemptive powers of being loved; and what it means to be human and superhuman, when being superhuman might also mean being subhuman or indeed non-human. I also wanted, as per usual, to write the kind of book I liked to read when I was 16 and 32 and 48 (right now), and in this case, I wanted to write a science fiction adventure with more than just the adventure, like the books I loved and still love by Robert Heinlein and Andre Norton, amongst others. Well, I guess you could also ask for a complete game based on the book. But lacking that, you can still play the beta version of a portion of a fragment of the game, at www.imperialgalaxy.com — where you too can be a Prince of the Empire. Read an excerpt. Visit the author on Facebook. Follow him on Twitter.